Join the mesh head revolution. 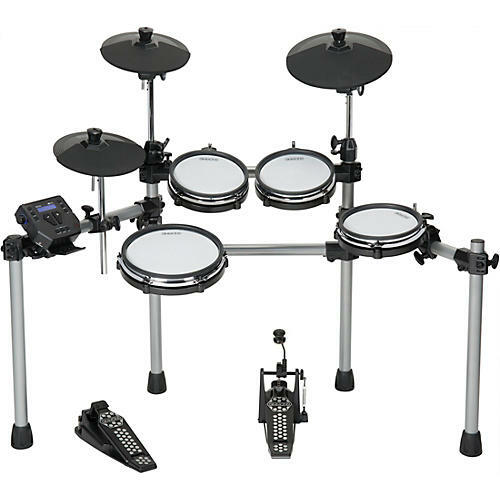 The Simmons SD550 full-sized 5-piece mesh-head electronic drum kit creates an ultra-realistic drum configuration with features normally reserved for much more expensive kits. It’s ideal for gigging, practicing, recording and learning. The tension-able mesh heads capture more nuanced playing than ever before. Enjoy advanced functionality via the 10" dual zone, dual-ply snare drum, three 8" dual-ply mesh toms, a crash cymbal with choke plus a no-slip grip on the kick pedal and hi-hat controller. The SD550 Module offers 371 awesome drum sounds across 25 preset drum kits and 10 user kits, making this kit ideal for virtually any musical genre from jazz to pop; from blues to rock and beyond. If you’re looking for power, versatility and value… the Simmons SD550 is your electronic drum set. Plus, the free, downloadable Simmons Basic iOS App offers effective teaching tools and sound-editing capabilities unheard of at this price range. From kit selection and editing, to game-like learning environments, to “play along” functions, the class-leading Simmons Basic iOS App makes interacting with your new kit fun and easy. Grab this impressive kit today.